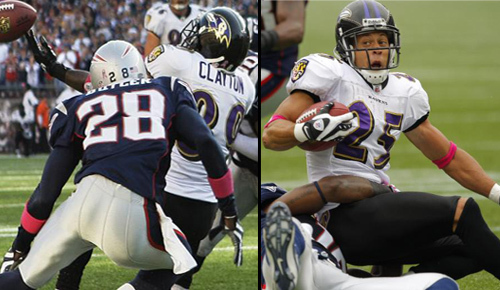 Some thoughts on yesterday’s Ravens – Patriots game. -I never thought I’d ever say this, but I would have liked to see Baltimore run the ball more than they did yesterday. There were only 17 rushing attempts the entire game. Credit New England, who shut down the run for most of the afternoon. With the exception of Ray Rice’s 50 yard scamper in the third quarter, they did a very good job of keeping the Ravens running game in check. But I believe with a little more balance; maybe the Ravens finish a few more drives. -Joe Flacco was good, but not great yesterday. I was extremely pleased with how he did in third down situations. On third downs, he was 8 for 11 and had a QB rating of 125. But on 1st and 10 with 1:11 remaining in the first half, and driving inside the New England 20, he threw a costly interception to Leigh Bodden. The Ravens were in field goal range and that pick cost them at least 3 points. -I think it is very weak for anyone to blame Mark Clayton’s drop on fourth down for yesterday’s loss. There were plenty of opportunities for the Ravens to score points throughout the game. Chris Carr’s fumble on the opening kickoff allowed New England to get 3 easy points. Combine that fumble with Flacco’s interception in scoring territory, and that is potentially six, even 10 points in the Ravens’ favor. Mark dropped a big pass that happened to be late in the game. Was it a mistake? You bet. But there many other mistakes yesterday that added up to the loss. -At the end of the day I am fine with this loss. 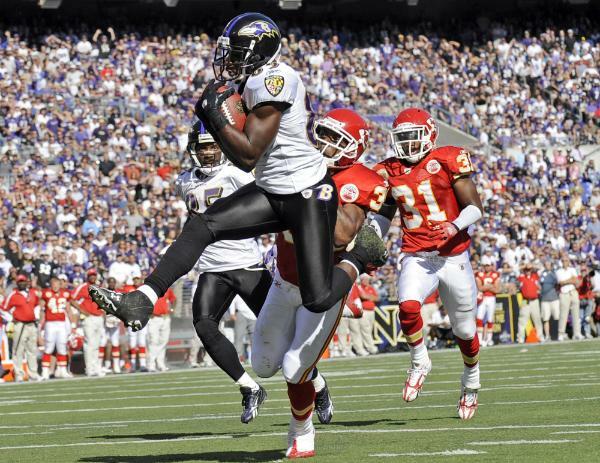 The Ravens proved to me that they are very good team and that they can play with the big boys. They had numerous opportunities to take control of the game and they didn’t. They had a chance to win the game at the end and that’s all you can ask for. And I honestly believe they LOST the game more than New England won it. That doesn’t mean anything in the standings though, a win is a win and a loss is a loss. But this team has to feel awfully good about where they can go in 2009. If they stay healthy, I don’t see them losing more than 4 games the whole season. The Ravens victory over the Chargers yesterday wasn’t pretty, but when have the Ravens ever been a team of style over substance? Never. The franchise’s M.O. for winning over the past decade has been to play great defense, and hope the offense can do SOMETHING. However yesterday, in front of a crowd of 66,882 at sun-splashed Qualcomm Stadium, it was a bit of a role-reversal as the offense picked up the slack for the defense. Willis McGahee rushed for 79 yards and was able to find the endzone twice. Dan Fouts made mention during the CBS telecast of how motivating it can be to a player when he has to earn his carries. This is a remarkably different McGahee than the one we saw in 2008. He has a great attitude this year and is looking even better than he did in 2007 when he averaged 81 yards per game and had almost 300 carries. Joe Flacco, aside from throwing an interception early in the fourth quarter, was brilliant. He completed 17 of 24 passes for 190 yards and a pair of touchdowns. His 27 yard lob to Kelley Washington looked great. He pumped to Mark Clayton who was setting up for a screen, and the Charger defense bit hard. What a great piece of play calling from offensive coordinator Cam Cameron. The receivers were decent; I was expecting a bit more from Clayton and Derrick Mason. Together they only totaled 4 receptions. Kelley Washington is quickly becoming one of Joe Flacco’s favorite targets. Todd Heap only caught one pass, but it was good for six and gave Baltimore their biggest lead of the game. Mason needs only 3 catches to become the 23rd player in league history to amass 800 or more receptions. For the Ravens’ defensive front seven, it was business as usual. They held the explosive Darren Sproles to only 26 rushing yards and the Chargers as a whole to 53. The play of the secondary was cause for concern though. Sproles and Phillip Rivers connected on a 81 yard catch and run that went the distance. And receiver Vincent Jackson snagged in 6 balls for 141 yards. Down the road, teams are going to exploit corners Fabian Washington and Dominique Foxworth like the Chargers. Each is only 5-foot-11, and when the Ravens face big, tall receivers, (i.e. Braylon Edwards next week and Randy Moss in 2 weeks) they are going to have get help from the safeties and use double coverage. If they don’t figure out a way to contain these playmakers, yesterday’s game will not be the only time Baltimore gives up 400+ passing yards. Overall, a win is a win and the play of this team right now should excite any fan. Both games this year have revealed weaknesses that could have potentially led to losses. 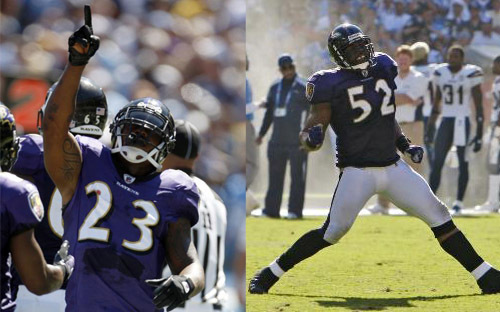 Yet both times, the Ravens have found ways to come out victorious. With Pittsburgh losing in Chicago yesterday, Baltimore now sits atop the AFC North. I know, I know, it’s early, but starting out 2-0 historically bodes well for the Ravens. The last three times they’ve done it, they’ve made the playoffs (2000, 2006, and 2008). An excellent opportunity to improve to 3-0 awaits this Sunday when Baltimore hosts the 0-2 Cleveland Browns. Yesterday’s 38-24 win was very satisfying for me as a Ravens fan. Some wouldn’t agree, but I’ll explain a little later. Many people are quick to point out that the ravens were heavy favorites, and that they were given a tough fight by one of the worst teams in football. I don’t share that same opinion. I wasn’t surprised at all by the Chiefs’ effort yesterday; you can always expect great effort from any NFL team on any given Sunday. I was a little shocked though, with the two long scoring drives they had in the fourth quarter. Fabian Washington seemed to be struggling with coverage and the pass rush was decent but not getting to Brodie Croyle as nearly as quickly as it should have been. And aside from the special teams mishap which resulted in a blocked punt for a TD, and a poor interception by Joe Flacco which led to another TD, the Ravens looked superb yesterday. Flacco was very sharp and it definitely looks as if he has a much better feel for the pocket than he did last year. He really know when to scramble, when to throw it away, or when to just take a sack. I loved his touchdown pass to Willis McGahee. It was very Roethlisberger-esque, if that’s a word. He bought himself time, kept his head up and extended the play long enough for a man to open up and he capitalized beautifully for the score. 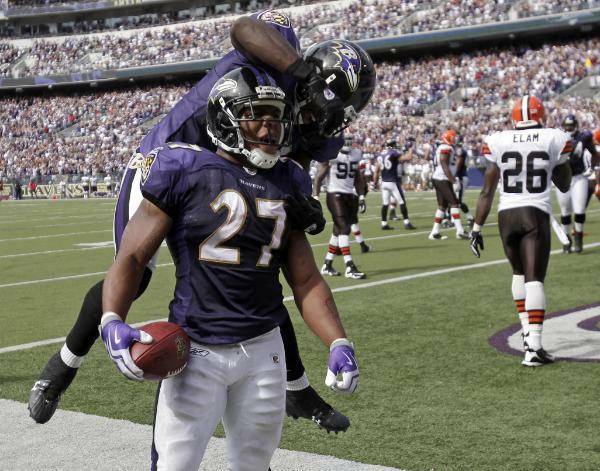 Ray Rice and Willis McGahee were great; they combined for 152 yards on a score on the ground. While Le’Ron McClain caught 3 passes and rushed 6 times for 42 total yards and a score. The running back by committee works! It really is the heart and soul of the Ravens offense. Mark Clayton’s beautiful game winning touchdown capped a solid day for the receiving corps. He, Mason, Heap, and Washington combined for 2 TD’s, 17 receptions, and 241 yards! As I mentioned earlier, the defensive play in the early part of the fourth quarter was cause for concern in my opinion. But let’s go over the performance of this defense on their first four series of the game. Four straight 3 and outs! They did not yield a first down until the 4:38 mark in the 2nd quarter! That is dominant. KC was 2 for 10 on third downs and only made 2 trips to the redzone all day. One of those was courtesy of Joe Flacco, not the D.
So back to my first sentence, you only get better when you make mistakes and learn from them. The Ravens made a few yesterday. 2 of them ended up costing them 14 points. Against tougher teams, it won’t be as easy to put up 38 and negate those two scores. You got to believe head coach John Harbaugh will have these guys ready and even more focused for a west coast trip to play the Chargers next Sunday. -Wow what a game. 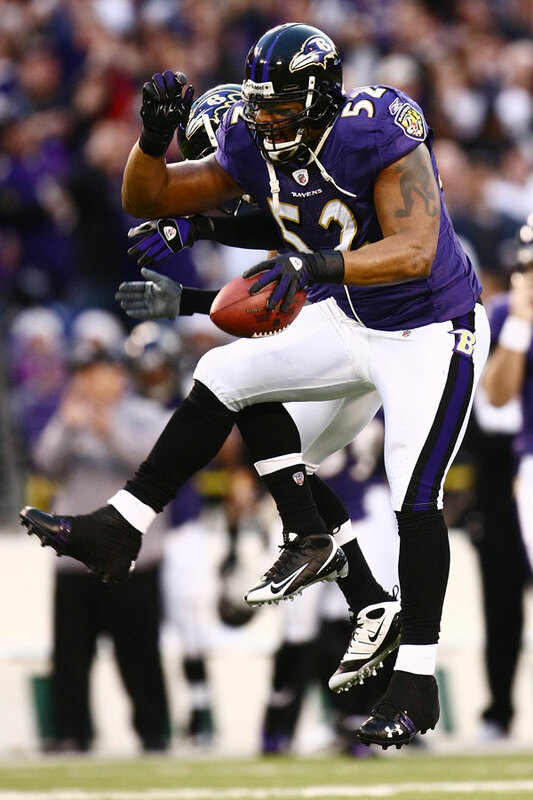 I cannot believe how tough the Ravens played today. They pulled out an amazing 13-10 victory over the Tennessee Titans to knock off the number one overall seed in the AFC. I will post more tomorrow morning when I am all settled down. Great win for the franchise. 1) Joe Flacco and the offense looked very solid. This was easily Flacco’s best game of the year. He looked very comfortable out there and made some incredible throws to Mark Clayton and Derrick Mason. Cam Cameron threw in a flea flicker and also got Troy Smith involved. The big play from Smith came in the third quarter when he lateraled the ball to Flacco, who then found him for a 36 yard catch and run. Le’Ron McClain, Willis McGahee and Lorenzo Neal all contributed nicely on the ground. Zero turnovers is a very nice stat to see. 2) The defense was great again. Although it looked like Maurice Jones-Drew would gain 100+ yards after a good first half, the Ravens played shut down D in the second half. I cannot say enough about Ed Reed. He had 2 more interceptions today to give him a league leading nine for the season. If he does not win the Defensive Player of the Year Award, I will be shocked and dissapointed. 3) The Miami Dolphins defeated the New York Jets to win the AFC East, which means Baltimore will travel to Miami for a 1:00 kickoff on Sunday, January 4 on Wild Card Weekend. •With homefield advantage throughout the NFC playoffs on the line, the New York Giants came from behind to beat the Carolina Panthers 34-28 on Sunday night. •This game had an amazing finish. The Giants were down 28-20 for much of the 4th quarter after Deangelo Williams scored his 4th rushing TD of the night early in the period. But with 3:24 remaining in the game, the Giants capped off a 44 yd drive with a Brandon Jacobs TD. New York coach Tom Coughlin decided to go for the two point conversion and it was successful as Eli Manning hit Domenik Hixon for the score. Tie ball game. •The Panthers drove down to the New York 32 yard line and John Kasey missed a 50 yard FG attempt with just 9 seconds left in regulation. So we head to overtime. •New York got the ball to start overtime and went three and out. When the Panthers got the ball, they did the same, going three and out. The G-Men began their second drive of OT on their own 13 yard line. On the first play of the drive, Derrick Ward scampered 51 yards to the Panthers 36. 3 plays later on 3rd down Ward ran 14 yards to the Carolina 19. On the very next play Ward ran 17 yards to the 2. Not wanting to risk a blocked kick or bad snap, Coughlin chose to run the ball in rather than attempt a field goal. Brandon Jacobs got the handoff and was not going to be deniefd as he pushed his way to paydirt and the victory. The Giants scored 14 unanswered points to stun the Panthers and clinch the top seed in the NFC playoff picture.